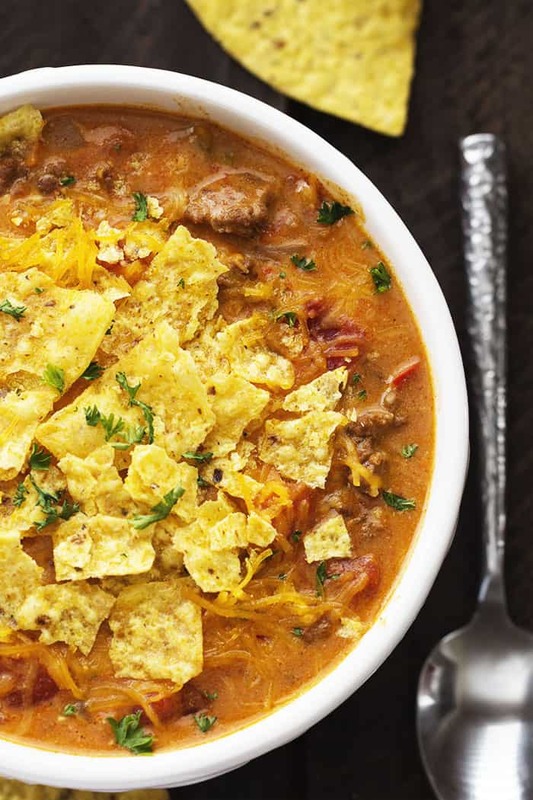 All of the goodness of cheesy nachos packed right into this soup! 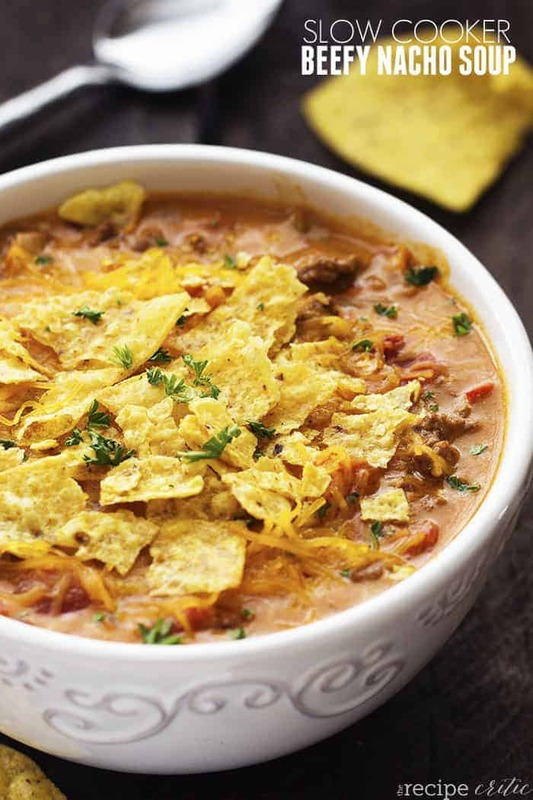 Slow cooked to perfection and topped with tortilla chips, this soup will become an instant favorite! Whenever I hear the word Nacho I think of Nacho Libre. Nachhhhhhoooooo! (In my best Jack Black voice.) Isn’t that movie the best? We watch it over and over again as a family and it never gets old! The first time that I saw it, it wasn’t that great to me. But then the second time it was hilarious, and now it gets funnier every time! Anyway. While we are on the subject of Nachos, lets talk about this soup. Picture your favorite nachos covered in cheese with a little bit of spice. 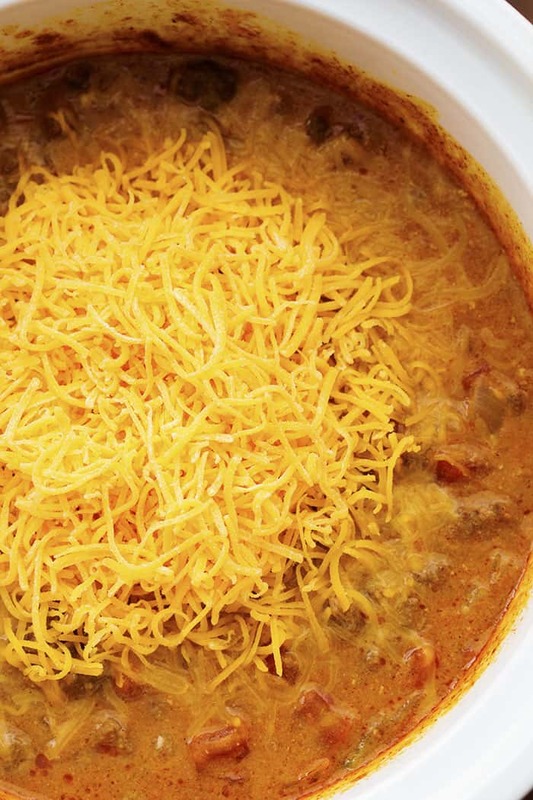 Now picture a soup that tastes just like your favorite nachos. This is that soup my friends. Holy cow. This soup is out of this world good. Seriously in my top 5 favorite soups of all time. I originally made it here but people would ask if it could be made in a slow cooker. Well I had to test it out for myself. It was just as good and the soup stayed a good consistency while in the slow cooker. My favorite part is at the end when you pile in the cheese and just let it melt. I made this on a busy day full of basketball games and other school activities. It was so easy to put in the slow cooker and stayed warm so that all of my family could eat at different times. My son said that this is the best soup that he has ever had. You guys are going to love this one! In a medium sized skillet cook the ground beef, onion, and garlic until beef is no longer pink and the onion is clear. Drain the grease and add to slow cooker. Add soup, taco seasoning, diced tomatoes and green chilis, and milk. Stir. Cook on low 3-4 hours. Stir in ½ cup cheddar cheese and allow to melt. Can be kept on warm for an additional 4 hours. Top with crushed tortilla chips and additional cheese if desired. This looks great. In the instructions, it says under step 2, to “add soup” two times…was that just a type-o or is there an ingredient missing? Thanks for the recipe, can’t wait to try it! Would there be a replacement for the condensed soup? I really hate to use the condensed soups and haven’t bought any in YEARS! Thanks. I can’t used condensed soup either, it contains gluten. Found this searching for a substitute. http://bethsfavoriterecipes.blogspot.com/2015/02/condensed-cheddar-cheese-soup-substitute.html. I can use gluten free flour in the substitute. Going to try this weekend. Made this today and family loved it. Thanks for the great recipe! Made this today and my family loved it. Thanks for the great recipe! Do you have nutritional info for your recipes? I don’t but my fitness pal is a great tool! My kids are extremely picky and don’t like to eat soup. However, I made this recipe last week and all of the kids enjoyed it. I used the cheddar soup since that is all I could find at the store and I left out the diced tomatoes and green chilis since they don’t like those. It was a hit! We dipped our chips in it and they thought it tasted like nachos with meat. I made a double recipe and it served 2 adults and 4 kids. So glad to hear! We love this one too! Is this soup freezer friendly? I am in a meal swap group and thinking about using this recipe. Right? But canned soup is so convenient at times! I am glad that you liked it! It looks like there is some cilantro or another herb sprinkled on top. I can’t find this in the recipe. Which herb is it? Pes is have to be nacho cheese soup? Or can I use actual nacho cheese from a can? I have to really watch what I eat, nothing spicy, fried. I don’t like seafood, rice or pastas. The beefy nachos soup sounds really good.? Can I use half and half instead of milk? That sounds great! A thicker-richer soup! MMM! Very easy and delicious! I put this over rice and added sour cream on the side! Family loved it!